However, it was Australia’s own cast iron, pushrod-OHV ‘grey’ Holden six that was as effective as any. 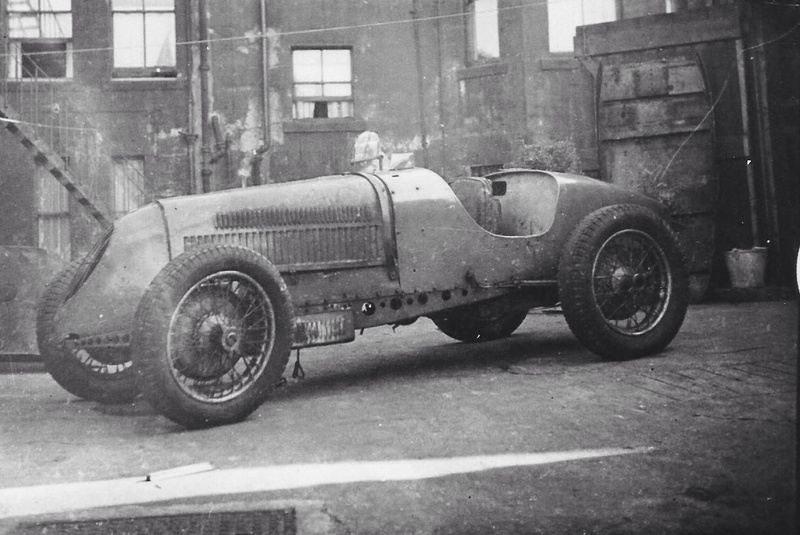 We will take a look at two important examples where a ‘grey’ successfully replaced the sophisticated mid-nineteen twenties single overhead cam, three valves per cylinder, 1500cc, Bugatti unit. 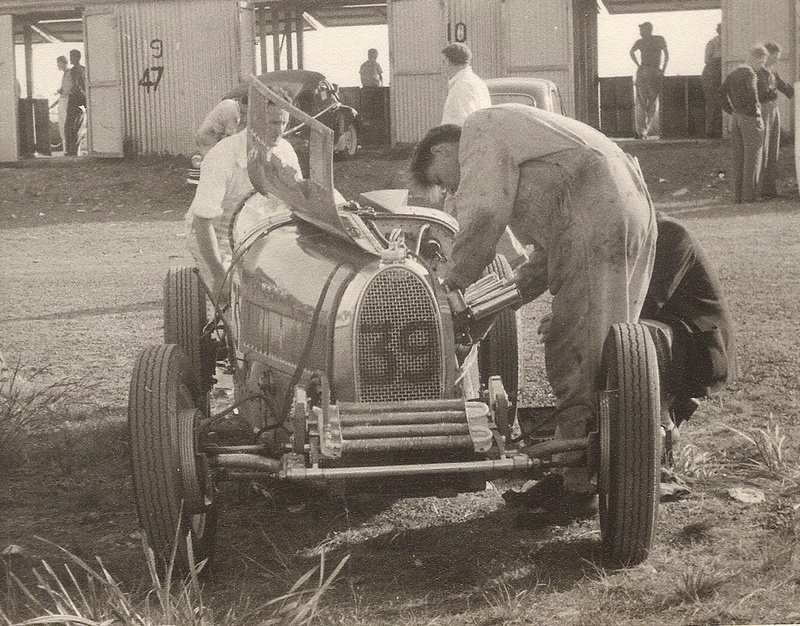 This is the Bugatti that multiple Australian Grand Prix winner Bill Thompson made his Phillip Island debut with in 1929. His race lasted but two laps before he exited with a blown-up motor – youthful over-enthusiasm perhaps? 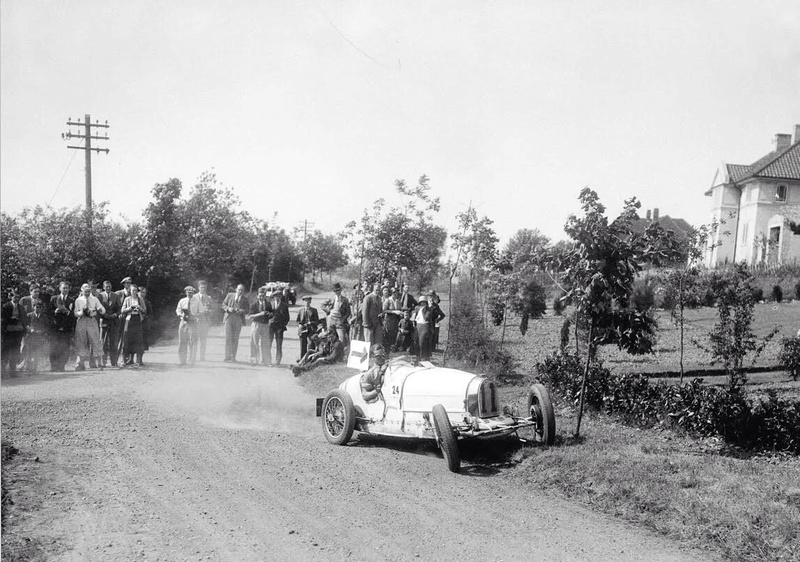 This was far from the end of the cars participation in the AGP, with the next owner Ernie Nichols contesting the 1934 and 1935 GPs at the same venue. 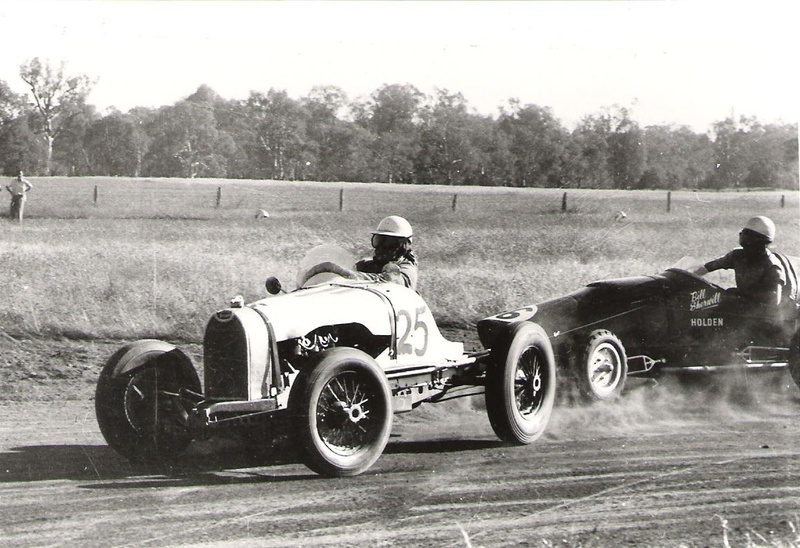 After a succession of well known drivers, it returned to Sydney where it was prominent in the early post war racing scene, first with Roy Murray and then Irwin ‘Bud’ Luke. The latter finished a splendid seventh in the 1949 AGP at Leyburn the ageing car winning the handicap and averaging 73 mph for the 150 miles. 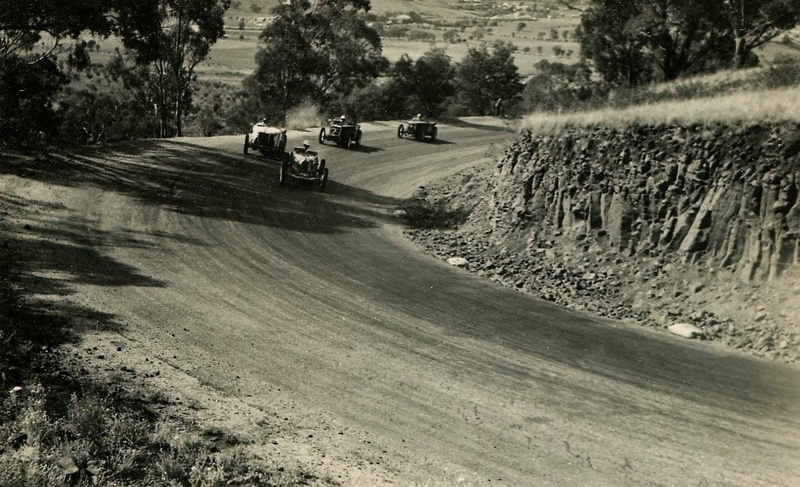 At Easter Bathurst, 1951, it was a victim of the well named Conrod Straight after having achieved almost 98 mph. It was back at Bathurst for the AGP in 1952, but now Holden engined. 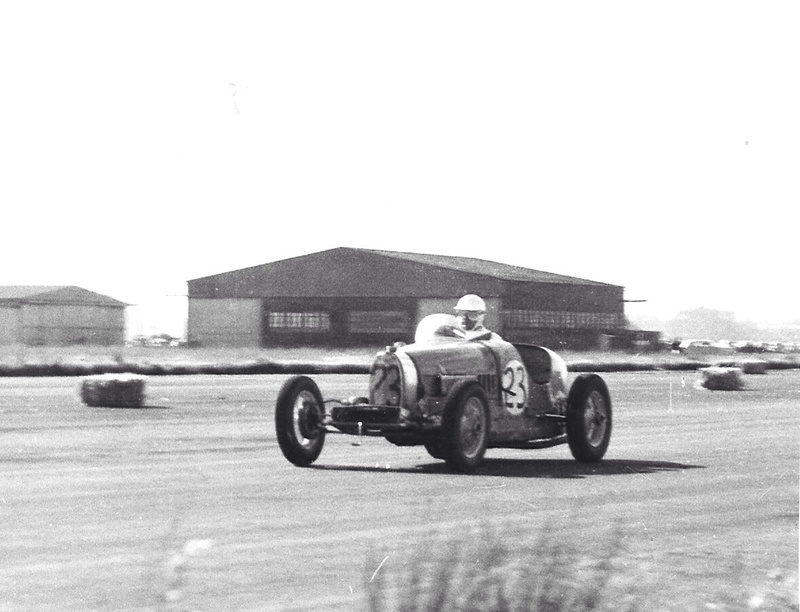 It was said to be the first Holden engined racing car – do our readers know of an earlier Holden powered special? The car today is little changed from when it was last raced seriously in the nineteen sixties and is still in regular use. In terms of the articles opening photograph. The Holden Bugatti was still an effective racing car into the sixties in the hands of a number of drivers – the 3 inlet trumpets are a give-away that this is no ordinary Bugatti. 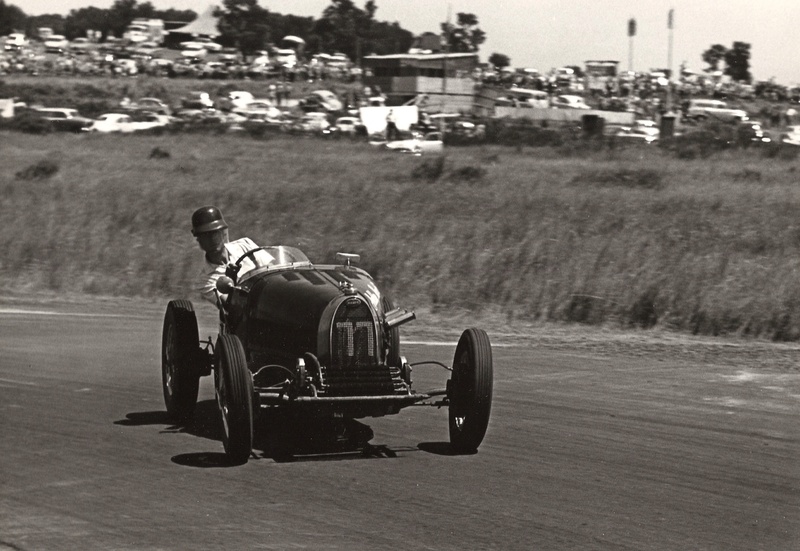 Who is the driver entering Repco Corner at Phillip Island, probably in the late nineteen-fifties though folks? We can confidently rule out Valery Gerrard. John Hall was rotund, as was John Marston. Therefore it is likely to be Barry Elkins or John Pyers? The old girl (above), still with unsupercharged Bugatti engine, was still able to hold a bevy of stripped TC’s up the mountain at Bathurst. 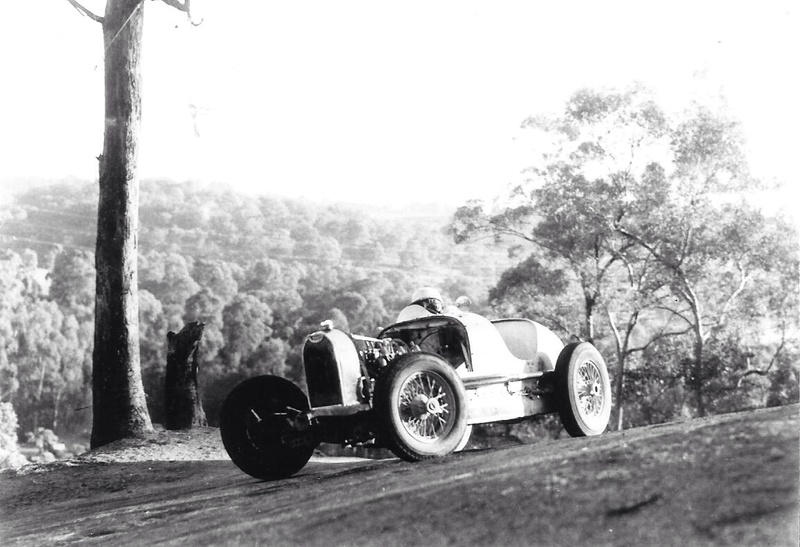 John (Cummo) Cummins, grand prix driver, raconteur, racing commentator and all round good fellow will be familiar to many readers as the driver of this Holden engined Bugatti special. And it was a very special car. New in 1928, it gained fame as the feature car of TP Cholmondeley Tapper’s “Amateur Racing Driver” (Foulis). The car was owned by New Zealander Tapper’s partner, Eileen Ellison, and they campaigned it extensively in England, Europe and South Africa. In the early thirties they had it supercharged at Bugatti’s Molsheim factory. 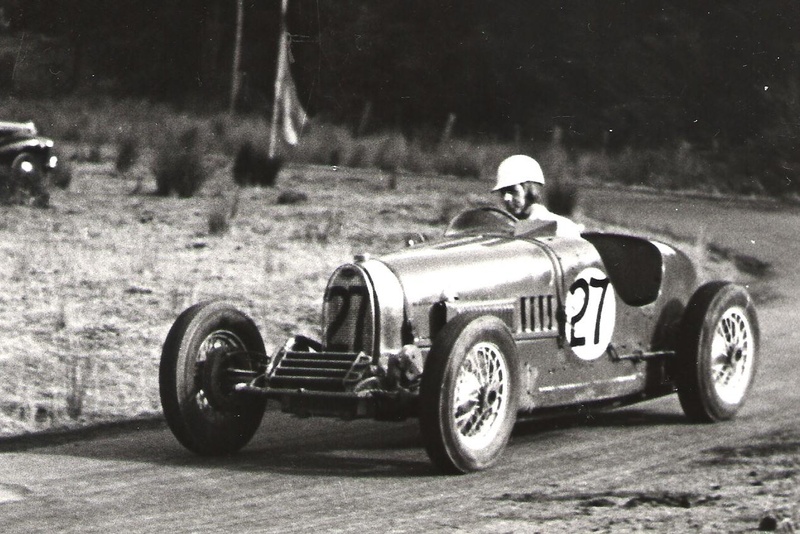 In the mid-thirties it was modified by Leslie Bellamy; he fitted his eponymous independent front end which was detrimental to the cars appearance, and probably also to its handling, as it shortened the wheelbase. Cummo found the engineless car in Newcastle-on-Tyne in 1952 and brought it to Australia where Len Sydney fitted a hot Holden engine. Here above is the down-at-heel Bellamy. No engine, no problem- fit a ‘grey’. This was possibly the third racing car so fitted with Lou Molina and Silvio Massola splitting the two Bugattis in the precedence stakes with their ‘MM Special’. John’s position as an engineer at Chamberlain’s gave him access to a veritable Who’s Who of tuning experts – this resulted in a standing ¼ mile time of 14.4 seconds and 135mph on Conrod Straight. In recent times the car has been returned to the standard configuration of a supercharged Type 37A Bugatti.